Podcast playback remains one of the biggest opportunities for Apple Watch. Apple doesn’t offer an official Podcasts app and watchOS doesn’t let developers create a fully featured app with features like sync, subscriptions, and even volume control. Outcast for Apple Watch doesn’t magically fix any of those limitations, but the app does work within current constraints in a way that makes it actually usable. The ideal Apple Watch podcast player would support streaming on Wi-Fi and cellular, syncing episode progress between devices, and offer subscriptions with alerts for new episodes, but third-party apps can’t create that experience yet. It is possible to download episodes on-the-fly and play them back over wireless headphones, and Outcast offers the most straightforward and understandable version of that. I’ve been using Outcast to play podcasts during outdoor runs with just my Apple Watch and AirPods, and Outcast doesn’t require logging workouts to work so you can use it with other workout apps. Outcast is made more approachable thanks to audio and visual cues thoughtfully placed throughout the app. For example, Outcast includes two sample “episodes” that explain how the app works and how to add new episodes. Third-party watch apps can’t control volume either, which is a limitation that isn’t obvious to users. Outcast addresses this by putting a fake volume control on-screen that explains how to use Apple’s Now Playing app to adjust volume. After one tap, this fake button can be hidden too like other visual hints. Outcast also thoughtfully makes suggestions when searching for a podcast episode to add. You can search by voice or with Apple’s Scribble text drawing method, and Outcast includes search suggestions to popular podcast networks like Relay FM and Gimlet as well. When you find the right podcast to play, Outcast lets you download an episode for offline playback and shows a progress bar with file size amounts included. This process can be slow when Apple Watch is connected to iPhone because of how it defaults to Bluetooth transfer, but disabling Bluetooth on the iPhone in Settings and relying on Wi-Fi dramatically speeds up the download. A companion iPhone app optionally lets you import (or export) your subscription library and paste specific podcast URLs for adding, but you can hit the ground running with just the Apple Watch app alone which is great. 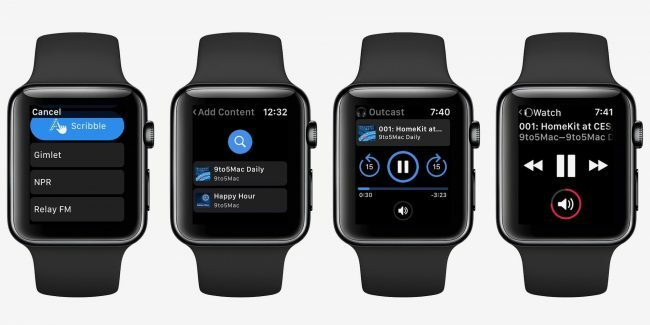 I still listen to podcasts primarily on my iPhone from Apple’s Podcasts app and on my Mac in iTunes, but Outcast for Apple Watch has proven invaluable as my go-to Apple Watch podcast player for now. Well worth a 99¢ download from the App Store if you want an easy way to play podcasts from Apple Watch before Apple (eventually, hopefully) adds support in watchOS.